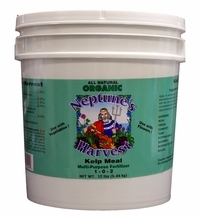 Neptunes Harvest Organic Kelp Meal is Ascophyllum Nodosum, which is widely recognized as one of the finest marine plants available for agriculture today. Kelp Meal is a natural and cost effective enhancement to any soil fertilization and conditioning program. It is suitable for all crops and applications, and can be mixed with most soil conditioners and fertilizers. It can also be incorporated into potting soils, seed and transplant beds, as well as composting material. Kelp Meal contains minerals, carbohydrates and amino acids. It will add organic matter to your soil and help it retain moisture. It will enhance healthy root growth. Kelp Meal will keep your lawn healthy and green, even through drought periods. For gardens, till the Kelp Meal in as soon as the soil can be worked in the spring. For perennial crops, apply at the end of dormancy. Mix thoroughly with the soil or growing media, taking care not to apply in concentrated form directly to the roots. To apply as a soil conditioner for fruit groves, ornamental trees, lawns and turf, apply directly as a top dressing.